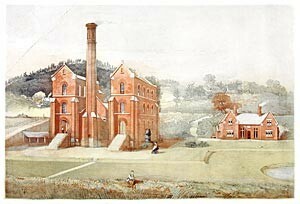 The image shown here is a colour illustration of Wall Grange Pumping Station, constructed in the late 1840s by Staffordshire Potteries WaterworksIn the thirteenth century the Leveson family owned land at Willenhall, in South Staffordshire between Walsall and Wolverhampton. During the late 1290s Richard Leveson married a lady called Margery who was the heiress of Henry, son of Clement de Wolverhampton. This marriage brought the Leveson family a considerable amount of land and property in Wolverhampton. From the fourteenth century onwards, the Levesons accumulated land and property in Staffordshire. At the time of the Dissolution of the Monasteries the family was wealthy enough to buy the lands which had belonged to Lilleshall Abbey in Shropshire and Trentham Abbey in North Staffordshire. Other purchases expanded the estate in Staffordshire and at Halling in Kent. The marriage of Frances Leveson to Sir Thomas Gower in 1631 bought lands in North Yorkshire. Disraeli spoke of the family’s talent for “absorbing heiresses” and this was never more spectacular than in 1785 when George Granville Leveson-Gower, the second Marquis of Stafford married Elizabeth, Countess of Sutherland and added to their English possessions vast estates in the Highlands of Scotland. The Sutherland Papers contain an enormous number of documents relating to the Leveson-Gower family’s lands, particularly their estates in Staffordshire. Medieval deeds, surveys, maps and plans, correspondence and gifts of land for schools, parks and churches can be found alongside mining accounts, political papers and advertisements for local events. These documents span the county, from Wolverhampton to Leek, from Eccleshall to Lichfield. Covering over seven hundred years of history, they tell us a huge amount about local life in Staffordshire from the thirteenth to the twentieth centuries. The Sutherland Papers contain plans of cottages and houses in Barlaston and documents relating to schooling in the area. Letters concerning repairs to the Church in the early nineteenth century and appeals for a vicarage house also survive, telling us about the development of Barlaston during this period. The Sutherland Papers contain documents relating to the establishment of an elementary school in Caverswall in the late nineteenth century. Valuations of timber on Caverswall Park Farm tell us about the agricultural history of the area, whilst documents relating to mining and the Staffordshire Potteries Waterworks Company provide an insight into industrial development in Caverswall. The Sutherland Papers contain a wealth of documents relating to Cheddleton, from Medieval times into the nineteenth century. Medieval deeds and sales papers from the early nineteenth century tell us about the development of land and property in Cheddleton. Plans of the Consall estate and a history of the Manor of Consall also feature here, providing an insight into the local history of Cheddleton written in 1835. Click here to see Cheddleton documents in the Sutherland Papers. From fifteenth century wills to the sale of ‘The Pines’ in the 1890s, the Sutherland Papers contain a variety of documents relating to Codsall including Elizabethan leases and papers relating to the establishment of schools in the village during the nineteenth century. The Sutherland Papers contain many plans of Hill Chorlton Farm from the nineteenth century and documents relating to the establishment of a wind engine at the farm in 1907. Surveys of Chapel Chorlton dating back to 1591, documents relating to the Newcastle and Eccleshall Road and Cotes Farm in Eccleshall also feature here alongside surveys of tenants in Hill Chorlton made in the 1790s. The rise of Hanley as a centre of industry in the Staffordshire Potteries is reflected in the wide variety of documents relating to the town which survive in the Sutherland Papers. Mining leases and papers from Hanley Colliery feature here alongside maps from the North Staffordshire Tramways Company. Papers relating to the establishment of the Hanley and Shelton Volunteers Association in 1803 and advertisements for local ironmongers and Turkish Baths in the town provide an insight into Hanley’s development during the nineteenth century. Click here to see Hanley documents in the Sutherland Papers. The Leveson-Gower family began their association with Leek in 1540 when James Leveson of Wolverhampton purchased the estates of Trentham Abbey of which Wall Grange was part. The family remained associated with Leek until the sale of Wall Grange in 1911. Leases for the farm and house from 1556-1610 survive in the collection today. The Leveson-Gower family were involved with many aspects of life in Leek, including the Churnet Valley Railway line which opened in 1849. In 1867 a station on the line was opened at Wall Grange. In 1849 the family were also involved with the Staffordshire Potteries Waterworks Company and the construction of a pumping station in Wall Grange which functioned until its closure in the 1980s. The Sutherland Papers also contain a number of documents relating to Leek in the early twentieth century. The fourth Duke of Sutherland provided land for a new Church in Longsdon during this period, and the collection includes a printed programme for the annual exhibition of the Staffordshire Agricultural Society held in Leek in 1910. Lichfield’s history is well represented in the Sutherland Papers which contain documents relating to life in the City from the Civil War into the nineteenth century. Commissions appointing The Earl of Essex and Sir Richard Leveson as Lieutenant and Deputy Lieutenant of the City feature here alongside nineteenth century plans of the Hartshorne Inn. A Map of the City and Borough of Lichfield from 1838 and documents relating to the Lichfield Races also survive in the collection. A number of documents relating to land and property in Lichfield including local schools and commercial properties can be seen here, featured alongside letters from Michael Johnson, the famous local bookseller and father of lexicographer Samuel Johnson. The Sutherland Papers also contain a wealth of documents relating to local politics and elections in the city during the eighteenth century. Election accounts, reports of corruption and exploitation, are just a few of the many colourful documents featured here. There are many fascinating documents relating to the history of Longton in the Sutherland Papers. From medieval deeds telling us about life in Longton in the thirteenth century to memoranda concerning Florence Colliery in 1900, the Sutherland Papers contain documents relating to all aspects of Longton’s history. Alongside correspondence concerning families living at Lane End in the early nineteenth century, Manor Court Papers tell us about the lives of Longton tenants in 1705. Industrial developments in Longton are reflected in documents concerning the railway at Lane End and improvements to the water supply at potworks in Longton. In addition, papers relating to Lane End Chapel, the development of roads and Lane End Cholera Hospital provide an insight into Longton in the eighteenth and nineteenth centuries. The Sutherland Papers contain a huge variety of documents relating to the history of Newcastle, from wills made by Newcastle people in the 1650s to papers concerning the distribution of charity to the poor during the early eighteenth century. Letters telling us about local tradespeople and their relationship with Trentham Hall feature alongside reports on the Newcastle Alms Houses during the 1840s. These documents and the bye-Laws of the Borough for 1859 provide an insight into the lives of Newcastle people from the seventeenth to the late nineteenth centuries. The Sutherland Papers also contain a wealth of documents relating to local politics and elections in the Borough of Newcastle during the eighteenth century. Election accounts, reports of corruption and exploitation, stories about the lives of voters and interviews with local publicans are just a few of the many colourful documents featured here. There are many documents in the Sutherland Papers relating to Perton during the seventeenth century. Surveys made in 1648 tell us about local people and the lands they owned during this period. Legal papers from a case concerning Perton Manor House in the 1630s include depositions made by local people providing an insight into life in Perton in the early seventeenth century. Papers relating to the history of Penn also survive in the Sutherland Papers, including a history and description of Penn Poor House made in 1846 and a detailed map of property and land in Penn from 1834. The Sutherland Papers contain many documents which tell us about the history of important buildings in the County Town, from the sixteenth to the nineteenth centuries. Documents concerning the sale of Greyfriars Monastery from 1581, now Greyfriars Business Park, are featured here alongside papers relating to Stafford House of Correction and the rebuilding of the Shire Hall. Wills made by the Williamson family, famous in Stafford’s political and civil culture, and papers relating to the Stafford Militia are just a few of the documents telling us about the history of Stafford from the sixteenth century onwards. Amongst documents relating to Stone in the Sutherland Papers are wills made by the Crompton family, a famous local family who were influential in Stone and the County of Staffordshire. Plans and surveys of Mickle House and Hooks Green farms tell us about agriculture in Stone during the early nineteenth century. Lists of subscriptions made towards paving the town in 1778 and accounts of Stone Parish from the 1820s are also featured here alongside correspondence from local people. The Sutherland Papers contain a variety of documents telling us about the history of Swynnerton. Eighteenth century correspondence of the Fitzherberts, a prominent local family, features here alongside papers relating to lands in Swynnerton during the nineteenth century. Documents and plans concerning the development of transport and communication links in Swynnerton, including the construction of roads and telephone lines also survive in the Sutherland Papers. A nineteenth century case concerning local tenants and Tittensor Heath provide a fascinating insight into the history of Tittensor during this period. The Sutherland Papers also contain wills of Tittensor people from 1804 and the cash book of Tittensor School made during the late nineteenth century. Many plans of local landmarks also feature in the collection, including plans of Tittensor Church and Vicarage and also Tittensor Manor House. The Sutherland Papers contain a wide variety of documents telling us about the history of Wolverhampton from the thirteenth to the nineteenth centuries. Land and property purchases, marriage agreements, licenses to open hospitals and repair St. Peter’s Church in Wolverhampton are amongst some of the documents relating to Wolverhampton in the fourteenth and fifteenth centuries. Lists of donations to local schools feature here alongside plans for shops and nineteenth century editions of the Wolverhampton Chronicle, all providing an insight into the development of Wolverhampton. Documents from railway companies tell the story of Wolverhampton’s railway history.